2017 Volunteer Placement is FULL! Register Now For 2018! Home2017 Volunteer Placement is FULL! Register Now For 2018! 2017 is going to end in 4 more months, and EPRC have already received enough volunteers placement for this year! So hurry up and register now to save your place in 2018, to gain one of your most unforgettable experiences in Vietnam! Read on to know why it is important for us to welcome volunteers and what volunteers at EPRC can receive from their time at our center. DOES IT MATTER FOR EPRC TO HAVE VOLUNTEERS? There are so many Rescue centers around the world. And there are also so many different concepts. There are some Rescue Centers which are only run with their own local staff. And then there are some which focus mainly on paying volunteers, to get the money in which is needed to care for the animals they look after. Your daily tasks will change everyday. The volunteers get a detailed look into the daily life and work of our keepers. They join all tasks from cage cleaning, feeding, to preparing enrichment. Especially bundling leaves time is like bonding time for everyone. It is also the chance to exchange language with each other. 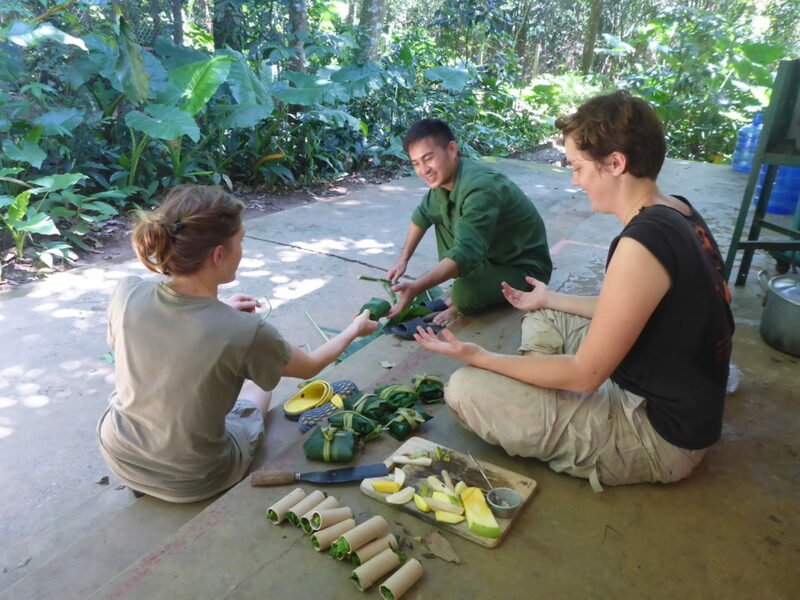 Volunteers at the EPRC it will be mostly a memorable time where they get to understand more about Vietnam’s rare primates or the life here in the rural area. If our volunteers are open-minded and like to search for more personal relations, there will be chances that they can visit our staff’s home and see more from their life in the rural area here. If you are super lucky when there is a wedding in the village, volunteers are usually invited and it will be definitely unforgettable memory. Grab yourself the chance to learn Vietnamese – one the most difficult languages in the world! And even driving a scooter! Our keepers get to learn more language skills and learn about other cultures in the world. It also makes them relearn and love their work more when having opportunities to “brag” about their knowledge to the volunteers. Our keeper are also really happy if there are volunteers who want to play sports, drink beer or sing karaoke after working time with them. If you have the intention to volunteer with us then don’t hesitate to contact us via email info@eprc.asia after reading thoroughly our Volunteer Information Booklet here! Share this article so more people can know about this life-changing opportunity! More testimonials from former volunteers and information related to volunteering at EPRC can be found HERE.